Creating the feeling of a large, spacious bathroom even when it isn’t, is something than can be accomplished with a few simple tricks. Even with small square footage, a bathroom can feel bright and open. A skilled designer looks at a small bathroom and sees infinite possibilities for making it look larger. If you’re not a designer, knowing where to start can be overwhelming. But before you start, there are few things to think about before you begin. First, size up the spot. How small is your bathroom really? Take measurements of the square footage, the shower size, the ceiling height. Also note how much space your current fixtures, cabinets, etc. are taking up. Second, understand how you’ll be using your bathroom. The way you decorate your guest bathroom will be different than the way you decorate your master bathroom. Getting clear on these lifestyle decisions before you move forward is really important. How much time do people spend in this bathroom? Is it an in-and-out spot or the place where long, contemplative bubble baths happen regularly? Who is using this bathroom? Is it primarily for you and your partner? Guests? This will impact how decorative or simple it is, as well as how much storage you’ll need. Tip #1:Mind your tile lines. The eye naturally follows lines. This is why vertical stripes make us look thinner. Use this to your advantage by arranging tiles in lines perpendicular to the longest lines in your bathroom. For example, if your bathroom is narrow from side to side, have your lines move from you to the back wall rather than from side to side. This will increase the visual width where you need it. Tip #2: Mind your grout. I always recommend using grout that is the same color as your tiles, whether they are large or small. The exception would be to use a light grey or white grout with multicolored glass or stone mosaics. The neutral grout compliments and punctuates multiple colors nicely. Also, using large format tiles in a small space actually make it appear larger because there are less grout joints, therefore reducing the lines that appear across the floor. Tip #3: Use large mirrors. In small rooms, big mirrors are best. If you can, get a mirror that goes to the ceiling installed behind your sink. This helps the ceilings look higher while expanding the square footage. Installing sconces in the vanity mirror instead of in the wall on either side of the mirror will bounce light around the room, doubling the amount of available light. Tip #4: Install a medicine cabinet. Similarly to installing towel racks, medicine cabinets help you utilize wall space for little odds and ends that would otherwise make the bathroom seem cluttered. If you can recess these into the wall, even better. Tip #5:Match your walls to your tiles. Rooms in a uniform color appear larger. 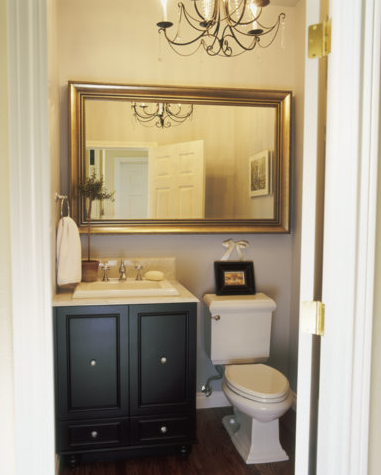 As much as you are able, be consistent in the colors you chose to cover large portions of the bathroom. Tip #6: Get light into the bath. Installing a recessed can light above your shower/tub will help it feel less closed off from the rest of the bathroom and may help you wake up quicker if you shower in the morning. Tip #7 Install a skylight. If your bathroom is on the top floor of your home, consider installing a skylight over the sink or bath. The extra light will help the room feel more open. If a skylight isn’t an option, install windows where you can to benefit from natural light. Windows with frosted glass give you the privacy you need while still letting in natural light. Tip #8: Paint the ceiling the color of the walls. Painting the ceiling a different color, especially a dark color, will make it look low. Painting it white will stop your eye right at the ceiling line, also making the bathroom feel small. When the eye can travel effortlessly, your space will expand visually. Tip #9: Prioritize storage. Clutter will make your room smaller because it takes up space both physically and visually. For this reason, an organized bathroom looks best. 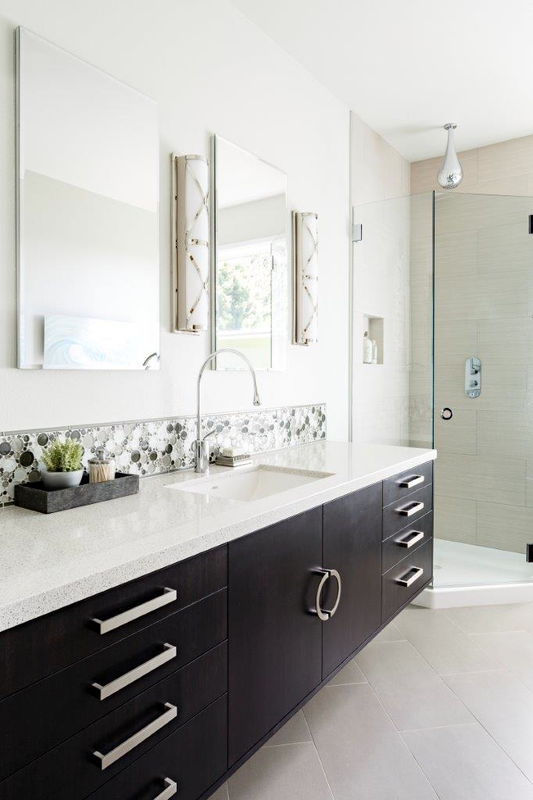 If you want to make your bathroom look larger, keep things off countertops and consider built in storage in the shower for shampoo. Tip #10: Choose narrow shelving units. If you’ve ever wanted to try those cute ladder shelves, this is the place for it. Narrow shelves are a good way to build in extra storage space without taking up much room. Are you ready to tackle your small bathroom project? Download this free PDF, The Small Bathroom Audit & Project Checklist, for a small bathroom checklist and space for organizing your project notes.